Here's another project that we made at Suzie's party last week.We used the new Baker's Box Thinlit to create this quick gift box. 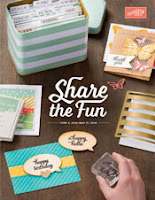 It's so easy to create with two 6" x 6" pieces of cardstock. Be sure to watch the video below to learn how to put it together. We dressed up this box very simply with some banners (cut perfectly with the Triple Banner Punch!) and a little punched greeting. Loving your color choices....anything would be great in this box! Thanks for sharing the video! Are You a "No Contact" Customer?